Reports suggest that Aprilia Storm 125 is scheduled to launch in the third week of April 2019. It will be another variant addition to the 125cc lineup. At the 2018 Auto Expo, Piaggio showcased the Aprilia Storm 125 scooter. It received some cosmetic changes over the SR125 and also dual-purpose tires. Rest of the specifications remain the same. Storm 125 comes in matte colour options, different graphics and smaller 12-inch dual-purpose tires. Piaggio indicated that this scooter will also have a say in off-roading, thanks to the tires. 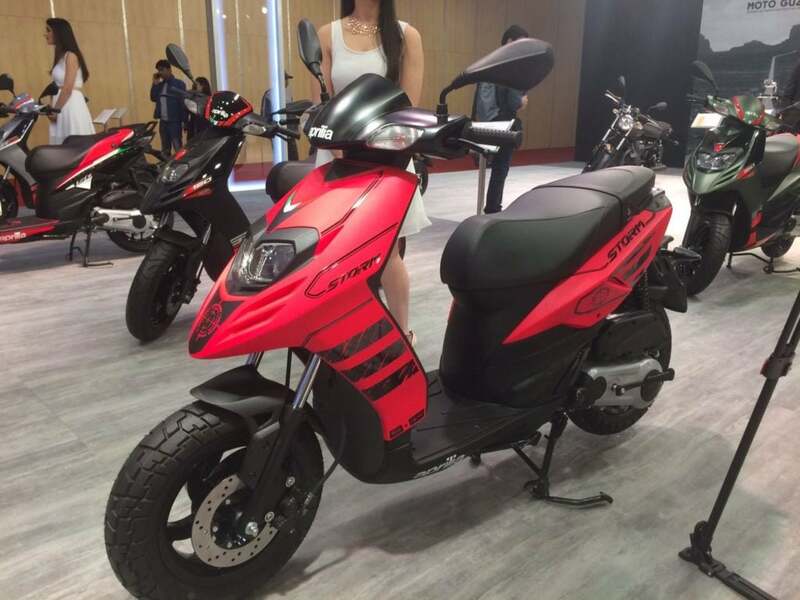 Bikewale reports that the scooter will debut by the third week of April 2019. The bookings will commence by the first week of April and deliveries on the launch day itself. Earlier, the scooter was scheduled to be launched in January 2019. However, due to the upcoming safety regulations and a sizeable stock of SR125 with the dealers, delayed the process. We expect Storm 125 to be placed after SR125 in terms of pricing. Heavy localization is expected on this scooter in terms of panels and equipment. Moreover, the dual-purpose tires will also be replaced by a cheaper alternative. The engine on the Aprilia Storm 125 will be the same as on SR125. The 125cc air-cooled engine is capable of producing 9.5 BHP at 7250 RPM and 9.8 Nm of peak torque at 6250 RPM. The power figures are the highest in the segment. We expect the prices of Aprilia Storm 125 to range between Rs 70,000-75,000. It might be costlier than the SR125, which goes for Rs 69,960 (ex-showroom prices). Piaggio is also planning to launch a family-focused scooter in India. Aprilia Comfort is rumoured to debut the Indian market this year. It will use SR125’s engine in a slightly detuned manner. However, between the SR125 and SR150, the latter is a better-selling scooter. While the monthly sales average of SR150 stays above 1500 units, the same of the 125cc scooter stays between 200-300 units. Aprilia is also planning to enter the entry-level performance bike segment, which currently has Yamaha R15 V3 and KTM Duke 125. It is planning to launch the RS 150 sportsbike and Tuono streetfighter in India.